BRAND NEW HOME! Quality home under construction. Large 3 bedrooms, 2 baths and 2 car garage... Mountain view lot. 8' garage doors, Gorgeous low maintenance landscaping (river rock,tree,shrubs,on an automatic watering system). Large cul-de-sac lot. Block walled Fully fenced rear yard. Large covered rear patio.. Synthetic stucco exterior, tile roof, decorative rock veneer. Interior features: Large view windows for natural lighting, upgraded fixtures and ceiling fans,neutral colors, hand textured walls throughout, open floor plan, pot shelves, breakfast bar, granite countertops, quality (tongue & grove), soft close cabinetry, stainless steel appliance package (stove, dishwasher & microwave) walk-in pantry, large sliding glass door to covered patio & natural lighting throughout. Quality tile flooring & upgraded carpet and pad throughout. 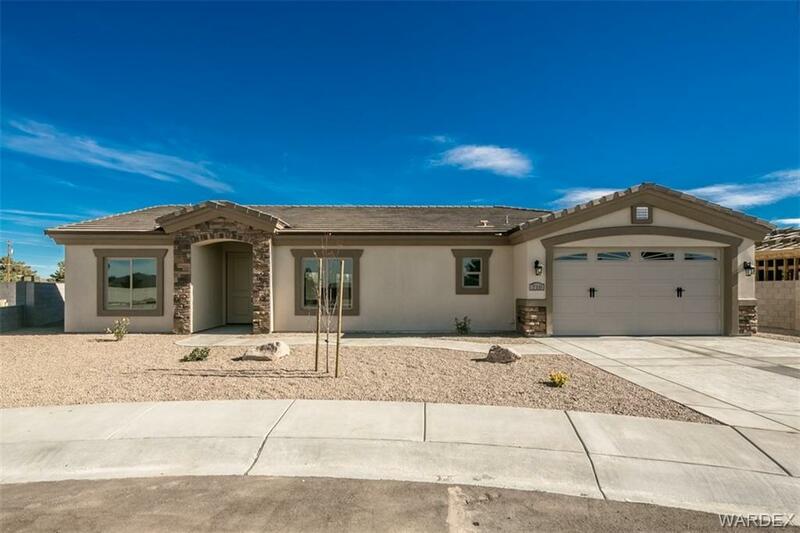 Large owner suite walk-in shower. . Beautiful area of Kingman AZ.. Close to the Hualapai Foothills. Close to schools, parks & dining. builder warranty. Some photos are similar to same model across the street.